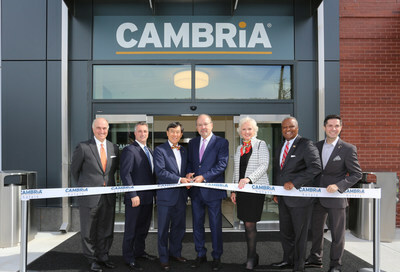 ROCKVILLE, Md., Oct. 17, 2018 /PRNewswire/ -- Cambria Hotels has opened its doors in the hometown of the University of Maryland with the grand opening of the Cambria Hotel College Park. Located at 8321 Baltimore Avenue, the 150-room new-construction hotel provides upscale amenities in a prime location for business and leisure travelers visiting the college town and greater Washington, D.C., region. This is the second Cambria-branded hotel to open in Maryland, joining the Cambria Hotel Rockville near Choice Hotels' headquarters. Southern Management Corporation, owner and manager of the new hotel, celebrated the grand opening of the Cambria Hotel College Park yesterday by presenting a $57,000 check to Elizabeth Seton High School, a local, private, all-girls high school. The donation will be used to fund scholarships, which will be awarded to students who are committed to participating at the Southern Management Hospitality Program at Elizabeth Seton High School. At yesterday's grand opening event, the Cambria Hotel College Park also announced a new partnership with the University Student Artists Exchange (USAE), a University of Maryland student-run community-based arts initiative. Through this partnership, representatives from USAE and the Cambria Hotel College Park will select student artwork to be displayed within the hotel. Tim Moran, a University of Maryland, College Park undergraduate, was selected as the inaugural USAE-Cambria Hotel College Park featured student artist. His work, Untitled, was unveiled within the lobby of the Cambria hotel during its grand opening ceremony. The goal of this partnership is to facilitate the exchange of creative content between college student artists and local establishments to provide college student artists with experiential learning opportunities that can be carried into their professional careers. The Cambria Hotel College Park is within walking distance to the University of Maryland's main campus and its surrounding shops, restaurants, and recreational activities. The hotel is close to College Park-based technology companies Immuta, Fluency Security, and Luvozo, as well as popular attractions such as the Capital One Field at Maryland Stadium, Xfinity Center, and the Mall at Prince Georges. Guests can arrive via three major airports that serve the region and, once checked in, easily access public transportation to visit downtown Washington, D.C. or Baltimore. "College Park is home to nearly 1,000 businesses and 40,000 students. As an educational hub and emerging technology center positioned between two major cities, College Park continues to attract modern travelers," said Janis Cannon, senior vice president, upscale brands, Choice Hotels. "Whether visiting students at the University of Maryland or traveling to the Baltimore-Washington region for business, the Cambria Hotel College Park Maryland provides the upscale amenities and guilt-free, approachable indulgences today's guests desire." "College Park's bold economic development strategy has helped the city emerge as an innovation and technology center. The area's transformation, along with its prime geographic location, makes it the perfect market to welcome the Cambria experience," said James LoBosco, executive vice president of Southern Management's Hotel Division. "We look forward to delivering to visitors and locals alike the distinct, upscale experience guests expect from the Cambria Hotels brand."